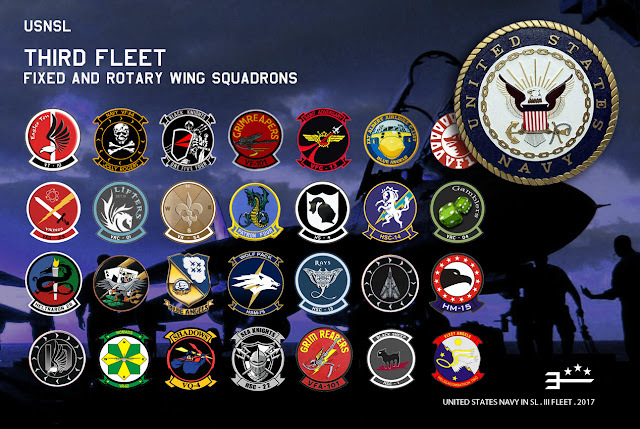 For the list of Squadrons of the III Fleet click here. Please inform your XO's and your local CO's of the way Third Fleet will henceforth organize the units, liveries and sequential in use in a standardized fashion across all units. 1. To prevent overlapping of existing squadron numbers and surface unit designations, a central data base will be created with Third Fleet Command so that any new addition may be cross referenced prior to its approval. All new squadrons and surface units need to be proposed to Third Fleet Command prior to establishment. 2. To keep an accurate record of our aircraft and surface vessels, registry of all existing and planned assets of this nature will take place at N.A.S. Miramar. This because NASM already has an extensive registry with sequential BuNo's and Hull Numbers not related to deployment. BuNo's and Hull Numbers are assigned when a new order is confirmed and in sequential order, regardless of type of aircraft or surface vessel and of its place of deployment. 3. To maintain a correct and true to real life appearance on all Third Fleet air and sea vessels, I have assigned CDR. Asra Kron, NASMCO, the responsibility of checking liveries before application in active duty. CDR. Kron may execute the livery herself or provide guidelines for their correct execution by any designer of a CO's choice. Keep in mind that some squadrons and sea units are already in this system, which makes the livery execution a lot easier if made by the same designer. This is true of CDR. Kron's work as well as of other designers whose work is already used in the Fleet. Squadron/Unit number and designation, aircraft BuNo or surface vessel Hull Number and finally aircraft or surface vessel livery need to be run by CDR. Asra Kron and approved by Third Fleet Command before application and use.